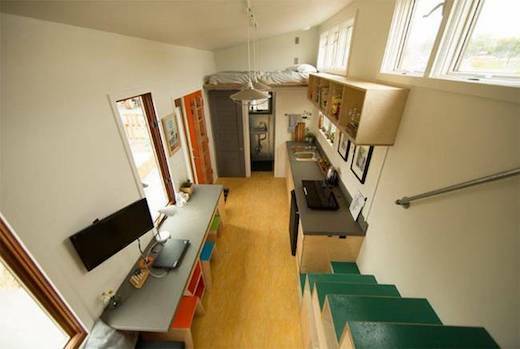 How much space does a person need to live comfortably? 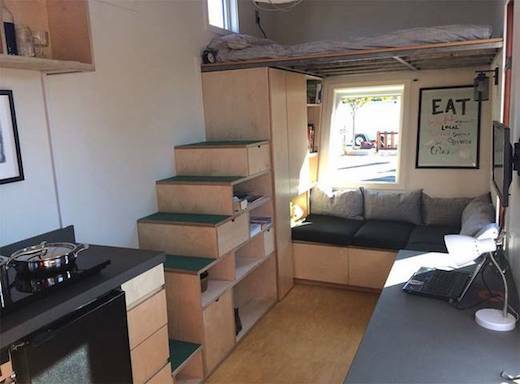 Not that much, according to tiny home enthusiasts. 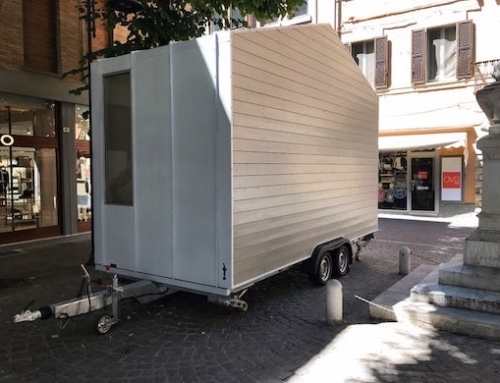 And tiny homes are certainly one way to combat the increased demand for affordable homes in urban areas. 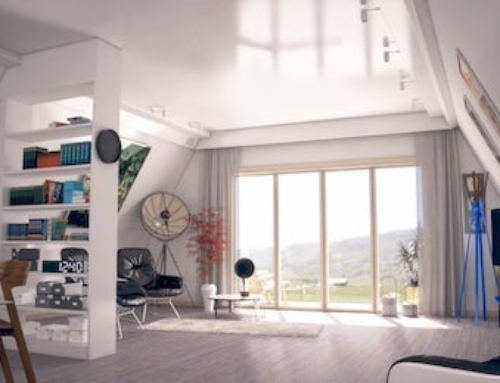 The students of Laney College in Oakland, California, have designed and built a solar-powered net-zero tiny home to help combat the housing shortage in the area. 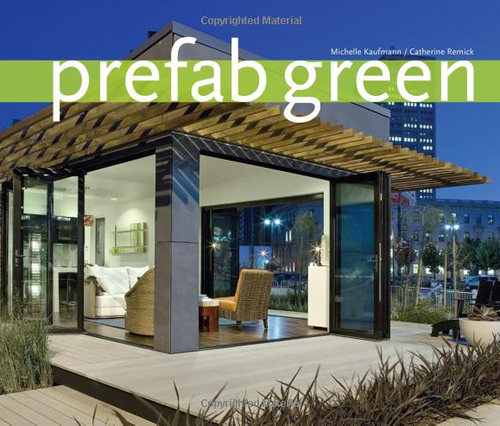 The home was entered into last year’s Sacramento Municipal Utility District (SMUD) competition and won the “Best Architecture” and “Best Design” accolades. 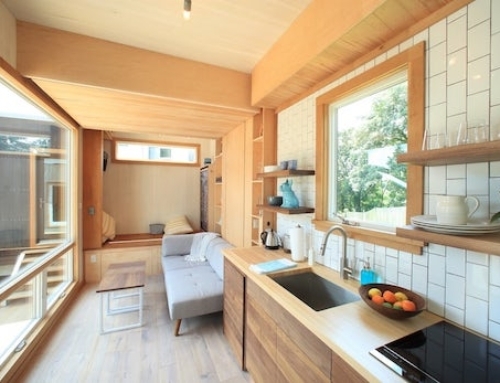 The tiny house is called the Wedge and measures just 202 sq ft (18.8 sq m). 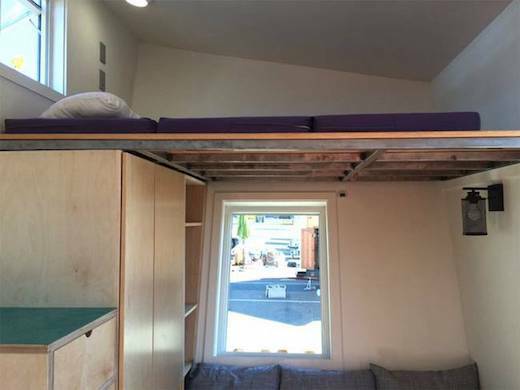 It rests atop a 20 ft (6 m) long trailer and is primarily aimed at those who have been priced out of their homes by gentrification and the rising rents it brought. 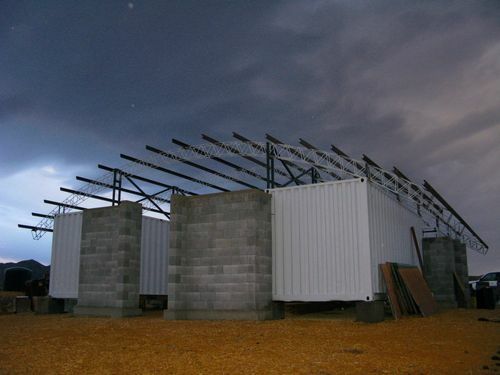 The home was designed in a way that ensures low maintenance and running costs. 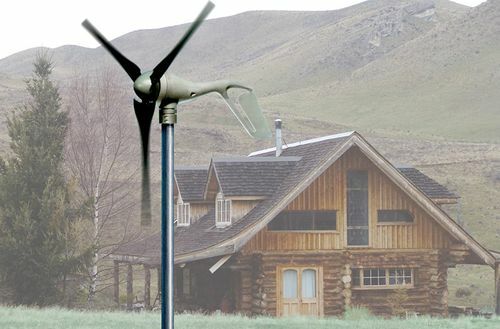 The home produces as much energy as it consumes, and it gets its power from a solar panel array mounted on the roof, while excess power is stored in a battery bank. An inverter converts the power from the 24 volt DC bank of batteries to the standard 120 volts AC for the appliances and devices that require it. However, most of the lighting, devices and appliances, including the water heater, are powered directly from the battery. The Wedge has an interesting shape, which is how it got its name. A part of it juts out and the main purpose of this design choice was to create additional interior space, but keep the same footprint. The home features a sitting area, two sleeping lofts, a kitchen and a bathroom. 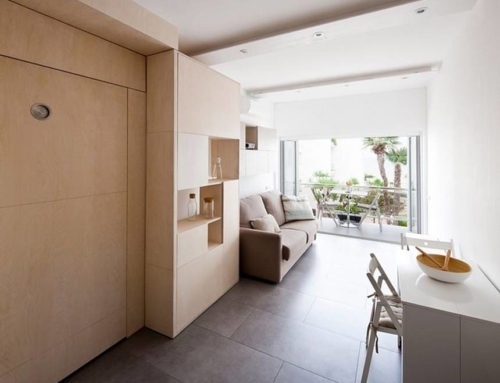 The sitting area is fitted with an L-shaped sofa, which hides a storage area. As for sleeping, the home can accommodate a family of three. 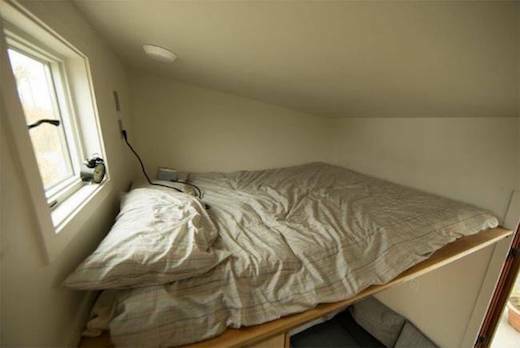 One of the lofts fits a queen-sized bed, while the other is big enough for a single bed. The larger is accessible via a storage stair, and the smaller one via a ladder. Although, since the lofts are just large enough to fit the beds, I would like to see some protective railing installed to prevent falls. The kitchen features a long counter that has all the necessities incorporated into it, namely a sink, a small fridge, a pantry and a two-burner induction stovetop. 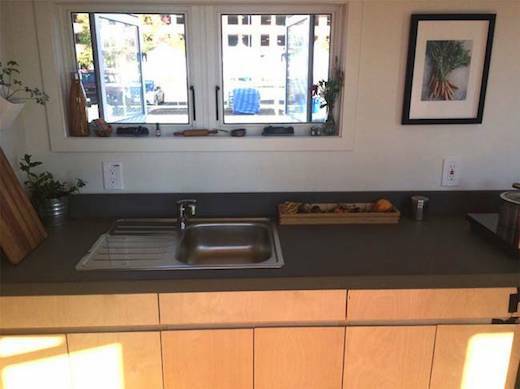 There is still ample amounts of counter space left over. 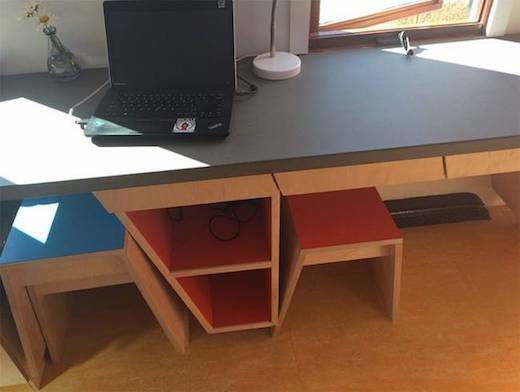 Opposite the kitchen is the working/dining area, which is fitted with custom-built furniture and has seating that can be stored underneath the desk when not in use. 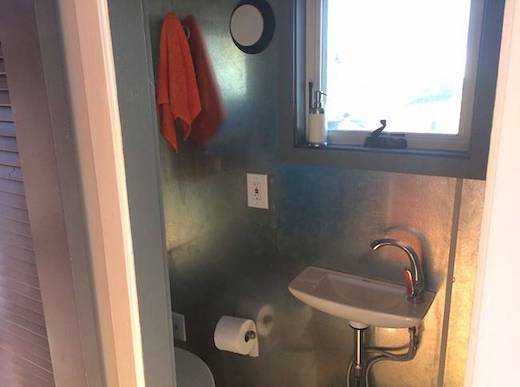 The bathroom is fitted with a composting toilet, shower and sink. The home is also fitted with a natural gravel and wetland plant based greywater filtration system. 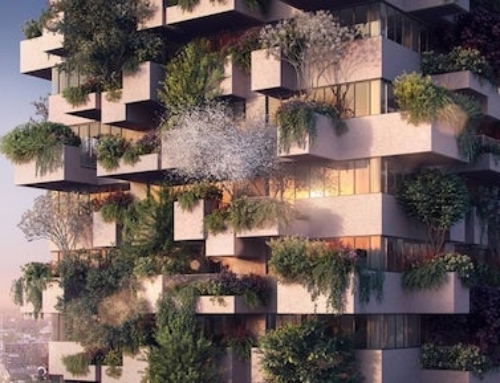 This water can then be reused for irrigation, since the plan for these homes is to be used as part of urban farming initiatives. 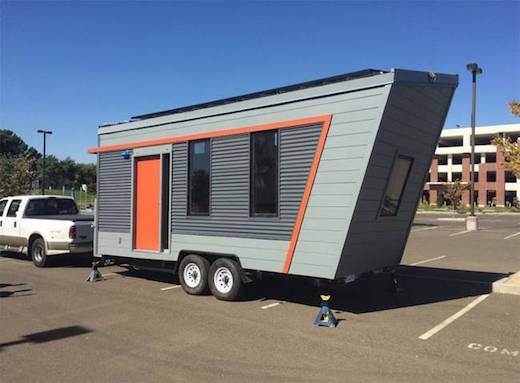 The Wedge is currently on sale for $55,000 via Tiny House Listings.